Dogfish Head has been known for odd or extreme beers for some years now. Randall the Enamel Animal was the original way to test these weird extreme beers without making huge batches. After the popularity of Randall the Enamel Animal in bars Dogfish Head realized they should make one for the home consumer, enter Randall the Enamel Animal Jr.
Let’s break down exactly what a Randall the Enamel Animal Jr. is and then get to the good bits, recipes!! You add the ingredients you’re infusing, add your beer, screw on the metal mesh level, and then screw on the cap. Dogfish Head advises you to leave the ingredients in to soak for 10 minutes. I’ve found this to be a good average time, but it depends on how intense the flavor of what you’re infusing is. Something like cinnamon can get aggressive fast so you may want to only include a bit or only for a shorter period of time. On the other hand I’ve found some fruits, especially raspberries, take more time to soak in so add plenty and give it at least 15 minutes. 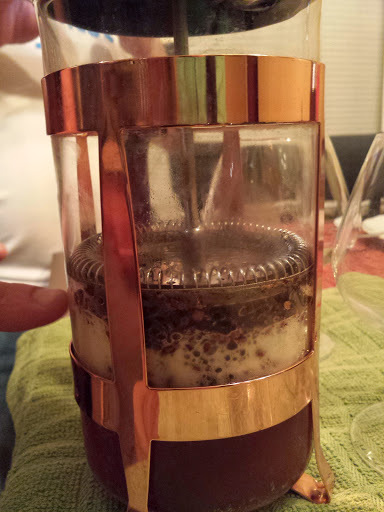 Yes, it is just a fancy French press. I’m not a coffee drinker, love the flavor though, so I don’t own a French press. If you are a coffee drinker then save yourself the $20 and just use a French press. Like this awesome one, my buddy Frank uses for infusing beer, shown here with Brooklyn Monster Ale with coffee and cinnamon. The main idea you want to go with is something that compliments the other flavors. A good place to start your experimentations is by heightening flavors in beers you have. One of the first really successful creations I made was by adding a few strawberries into the Randall with MadTree Sol Drifter. A second approach is emulating crazy beers you’ve tried before or always wanted to try. I did this with a Dark Horse Plead the 5th, cinnamon, cacao nibs, vanilla beans, and a habanero in an attempt to emulate Westbrook’s Mexican Cake. Another, somewhat more common and traditional infusion to make is with hops. This is a great thing for homebrewers to do who want to get an idea of what kind of flavor and aroma hops will add in dry hopping. You’ll want to add the hops, whole leaf are better than pellets for this purpose, to something not overpoweringly flavorful. If you’ve had a Bud Light that some friends burdened you with after a party here’s a good use for it. 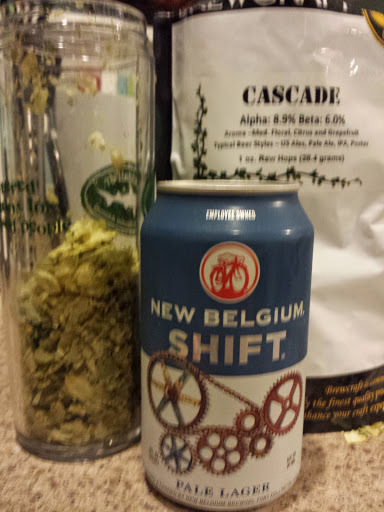 In my case, I went with a can of New Belgium Shift and some Cascade hops. Sure this is a beer blog but why not Randall a cider? A friend of mine hooked me up with a 4-pack of Smith & Forge Hard Cider, which is MillerCoor’s entrant into the cider market. I had one and thought it was OK then let the other cans sit for a few weeks thinking that sooner or later some cider lover would come over and relieve me of them. After a time I found myself with a fridge surprisingly devoid of beer, it was then I had the inspiration to dice up apples and Randall them with the cider. 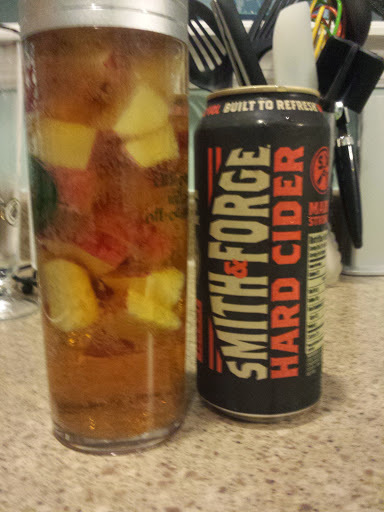 10 minutes later I knew the other 2 cans of Smith & Forge would never last. 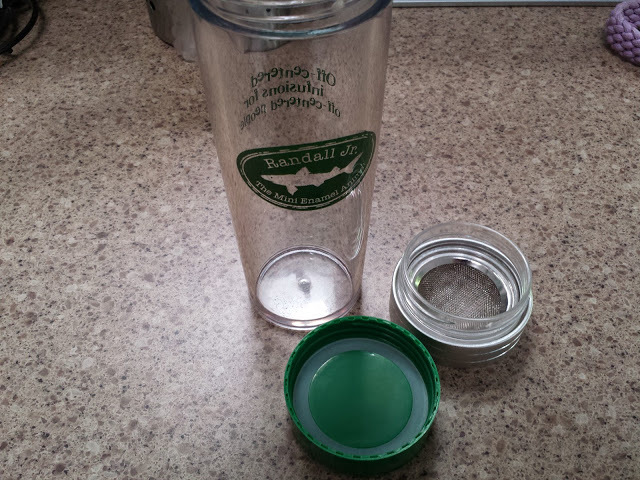 What came out of the Randall was a delicious super tart and nearly puckering cider. Now all this time we’ve been talking about infusing things in beer but, what about infusing beer in things? After obtaining a bottle of Goose Island Proprietors Bourbon County Brand Stout (standard BCBS in Templeton rye barrels with coconut), I decided to compare it to a BCBS with coconut in a Randall. Then I recalled a friend who had done a similar experiment… but they put the BCBS in the coconut! 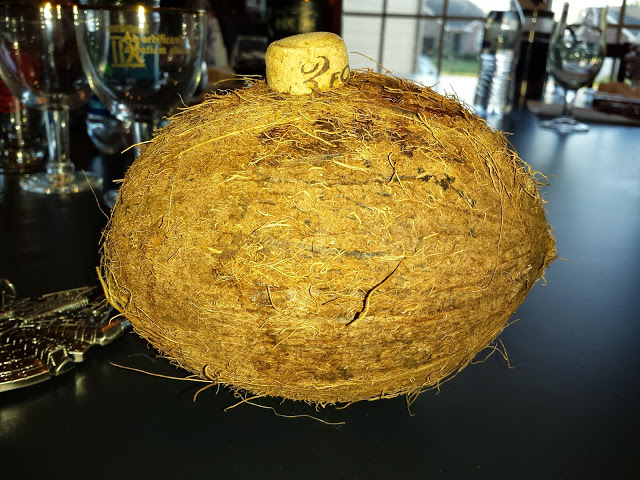 My friend drilled a hole in a coconut, dumped out the milk, poured in the beer, corked the hole and let it sit for two days. He now claims Goose Island stole the idea for Proprietors from him as his creation predates it by two years. We repeated that process earlier this month. Personally I’m not a massive fan of coconut flavors so I preferred the more subtle flavors from the Proprietors but if you love coconut you have to give this a try. 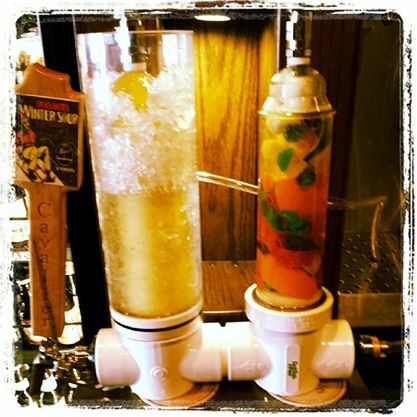 As you’ve, hopefully, seen the only limiting thing when infusing beers is your imagination. Lastly, I want to give a shout out to Brass Tap in Clifton. They’ve been rocking a full-size Randall for months now and have recently added a special menu just for French press infusions. Since this post went live last year Ei8ht Ball has also started doing a Randall infusion every weekend. Check their Facebook page for details on what stuff is getting put into what beer. What’s your favorite beer infusion recipe? Fun post! I’ve always thought about getting a Randall Jr or French press, but just never took the plunge. I think it’s really cool that Brass Tap offers this, let alone walks customers through the process. I’d strongly advise getting one to start playing with. Being a heat junky I love throwing habaneros into stouts, which I do on a weekly basis now. This is just what I’ve been looking for! I received a Randall Jr. for Christmas and I couldn’t think of anything to steep but stone fruits in a 60 minute IPA. It was alright and certainly changed the flavor, but I wanted more. The Brass Tap list is great for jump starting my imagination. Thanks, Tom!